So I’ve been thinking recently whether using an android phone or tablet is consistent with a concern for privacy, a desire to avoid monopolistic products, and a sympathetic attitude towards open source software. The conclusion I’ve come to is no – Android is pretty evil. First a bit of background, Android is at its base an open source project – the “Android Open Source Project” (AOSP). However instead of the normal way open source projects run – where the program is made in the open and people can see and contribute towards development – Android is developed in house by Google, and then once it’s been released all the bits are released at AOSP. While Android may be open source at its base, Google’s behaviour with Android shows us what happens when ostensibly open source projects are taken over by corporate pressures. While the Google-AOSP relationship itself is a bit suspect, the bigger problem is that Android is becoming an increasingly closed system. Google is slowly taking bits out of the AOSP and making them closed source. Ron Amadeo has called this “closed source creep” and has written a great piece about it at Ars Technica. Google’s doing this for a couple of reasons. First, it helps them overcome the issues they’ve had trying to update the software and OS on Android phones in the face of reluctant phone manufacturers and mobile phone carriers. If Google can simply close source the programs and package them up into software available through Google Play, then it’s not so important that people are using an older version of Android. Secondly, Google is trying to assert control over the ecosystem, and make sure that competitors have a really hard time breaking away from Google and Android. In Amadeo’s words, Google “seems to be doing everything it can to give itself leverage over the existing open source project”. 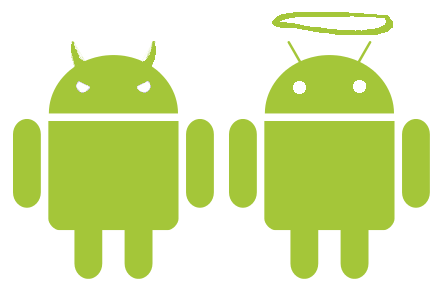 At a more theoretical level, Google has been criticised by Spreeuwenberg and Poell (2012) for picking and choosing open source principles in the development of android. They write that Google has “strategically adopted particular open source practices, but ignored others”. If you’re a bit unsure about Android after reading that, thankfully there are alternatives! A big and quite well known alternative is CyanogenMod (CM). CM is basically pure open source Android with a few modifications, and apart from it’s terrible difficult-to-spell name, the project is quite promising. It has the big advantage of being more open source than normal Android, while also allowing users to install Google apps if they choose. Although installing Google apps is possible, it is a slightly complicated process, and generally the process of installing CM as your mobile OS is not particularly easy. CM also highlights the difficulties competitors to Google face. Google’s applications like Gmail and Google Maps are a must-have for a lot of people, and basically the only way to get them is to use iOS or Android. CM has talked recently about wrestling control of Android away from Google, and about starting up their own app store. My worry is that move is surely that’s going to antagonise Google to the point that they stop allowing CM to use Google’s apps? Taking a step away from Android, there are some promising, and truly open, alternatives emerging. FirefoxOS is a web-based operating system made by Mozilla. The basic idea is that instead of requiring app makers to recode their apps every time they want to put it on a new platform, app maker should just make html5 web apps, which could be compatible with all devices. Mozilla is primarily aiming FirefoxOS phones at developing markets at the moment, in an attempt to provide cheap phones to people who can’t afford higher-end phones. However, they’re progressively launching FirefoxOS in more and more countries worldwide, and I imagine the OS will slowly work their way up higher-end phones too. Finally, the Ubuntu phone has been on the horizon for a very long time. It’s been glacially slow to emerge and actually reach production and release. If you were cynical, you could argue that by the time it arrives it’s going to so late arriving that the battle has already been lost, and it might only attract a few open source nerds at the fringes. But here’s hoping more will come of it!